What exactly is ERP today? Human users utilize the software tools of part 2 to perform administrative actions (like creating a Purchase Order), based on their own criteria, mostly dictated by company methodologies and policies, but also determined many times by their common sense, applied to the information contained in the database in part 1. The very name ERP, “Enterprise Resource Planning”, is a euphemism that does not reflect the true nature of existing ERP suites. Resource planning is mostly left for the human users to do, based on the data in the company database of part 1 and using the software tools available in part 2. Actual automated resource planning done by the existing suites is very limited, if at all present, as a function that the ERP suite will perform on its own. Planning is mostly left to the humans, while the ERP suite provides information and tools for humans to execute the planning. Both parts of existing ERP suites have been very well refined and polished, providing eye catching user interfaces, ingenious data representation methods and sophisticated data analysis techniques. Several ERP software providers have even started to offer Artificial Intelligence data analysis tools, like what is now known as “big data”, tools that get the analysis of the existing company data in part 1 to new heights. However, this is of little, if any, interest for small and medium size companies. But no provider of ERP software has shown any interest so far in producing software that actually performs the tasks and decision making of the human users, that are still ultimately responsible for using parts 1 and 2 to act, in an informed way, on the existing company information. Many human user decisions and actions that take place when utilizing an ERP suite are as simple as noticing that some raw material is about to run out, or about to go below a certain minimum level, and then creating a Purchase Order to replenish that resource. While much is expected by the general public from Intelligent Robots based on Artificial Intelligence, like self driving car robots, creating a Purchase Order when something is needed, and scheduling it to be sent to the vendor so the purchased materials will arrive “just in time” is not that complicated. Aboard Software’s vision is that these simple actions and decisions, and some much more complex ones, currently left to human users by existing ERP suites, can be performed by intelligent software robots based on Artificial Intelligence algorithms. Robots never miss work, never introduce human errors and are always ready and vigilant, working 24/7, monitoring changing conditions and relentlessly acting when it is needed. And they are not paid a salary and require no benefits. We believe the future will be one in which offices and warehouses have substantially less human workers. We believe that is a reality where goods and services provided to everyone are delivered faster and are much more affordable. The teams of robots must be designed to perform the myriad clerical decisions and tasks that are required daily in a normal company office. They must report to their human team leaders and show the product of their work in a simple, graphic and intuitive way. Human users must then supervise the work done by the robots, and eventually override it, due to special considerations when they apply. Robots must always respect what humans changed, no human-generated or human-altered transaction should be changed or deleted by a robot. And robots should in principle not communicate directly with external entities like vendors, customers or service providers. That should be done by the human supervisors, upon their approval of the work the robots did, and following the optimal schedule prepared by the robots that did the analysis. A team of software robots can use any ERP suite, but as it’s the case with human users, it can be impaired by the limitations of the suite they use. Embedding some members of the team of robots into the ERP suite itself provides faster response, as robot actions can be triggered instantaneously when conditions require it. Teams of Robots provide the ideal assistants for CFOs and COOs. Even the more complex tasks described above do not remotely address the “entrepreneurial magic touch” that creates opportunities for companies to make a profit or even to have a reason to exist. But as much as teams of robots can provide the ideal assistants to the CFOs and the COOs, they can also provide the ideal assistant to the entrepreneur. While this might seem farfetched, it’s already happening since the early 1990s in the securities trading industry. Since then the “quants”, ex mathematicians and physicists, started creating robotic algorithms for identifying opportunities for the profitable trading of securities. Those algorithms focus only on making money, and they bypass the traditional sources of “fundamentals” information for determining what is a safe and fast money making investment. We believe that in the future the same will be accomplished for the commercial trade and manufacturing industries. At Aboard Software we are already moving in that direction. The new generation of ERP Suites, called Active ERP Suites, incorporates Artificial Intelligence (AI) and Intelligent Robotics (IR) into the traditional ERP software. Aboard Software’s aERP is the first such ERP Suite integrating AI and IR into a state of the art traditional ERP Suite. It is deployed and in use by multiple customers. But why? What are the advantages of using AI and IR in ERP software? What do AI and IR do? How do AI and IR work in the ERP arena? An algorithm that determines what tasks need to be done and performs those tasks, like creating Work Orders or Purchase Orders is such a robot. While a software robot is not manifested physically, it is no less of a robot. It acts following certain rules to perform certain expected tasks, creating new data structures like Work Orders or Purchase Orders for example. What is Artificial Intelligence as applied to software? Consider a problem that an algorithm can't solve, like optimally (or even acceptably) scheduling Work Orders. The number of possibilities is far too big (like in exponential problems or combinatorial problems); they can’t all be examined to choose the best as to do so might take the life of the universe. However, an algorithm that uses heuristic criteria and certain AI methods can produce a solution that is very good, even if not optimal in the strict sense. The achievement of AI is to be able to produce a human-quality solution for problems for which an algorithm would take a forbiddingly long amount of time to find the best solution. A typical case of AI applied to software is our Operations Scheduler. Some problems of extremely high complexity, which are impossible to solve by implementing an algorithm for them, also benefit from AI methods, because the AI solution is much simpler to implement in those cases. Humans can produce solutions by methods that do not involve looking at all the possible solutions and choosing the best. AI tries to do the same, and in many cases it does it even better than humans. When AI is used to define complex rules for the tasks a robot performs you get an Intelligent Robot. Good examples are our robotic users, that create Work Orders and Purchase Orders and optimize merchandise utilization by applying complex heuristic rules that do not depend only on the mechanics of building Work Orders or Purchase Orders, but that also incorporate experience gathered through learning and summarized in the heuristic rules that guide the robot in order to optimize the inventory and the operations. This is the case when a simple robotic algorithm is guided by heuristic information that provides rules that transcend the definition of the task to perform. This heuristic information could be compared to the experience that a good plant manager or shipping manager brings in when he is hired by a company. He has no specific experience with the new plant, the new products, the new warehouses and the new manufacturing processes, but he looks for efficiency and effectiveness applying variations of rules he learned to apply to other similar problems in other companies. Refining heuristic criteria initially loaded from prior knowledge databases by adding new criteria created from the robot’s own accumulated experience in the field in order to perform a task better is more than robotics, because the robots don't follow simple predetermined rules that come directly from the definition of the task to perform, and because the robots learn how to perform the tasks better as they do their daily work. So that is more than robotics, it is what we call Intelligent Robotics, because the robots are guided by more than the simple rules directly derived from the task to perform. In the case of creating Work Orders or Packing Lists, for example, the key is to look for the best assignment of the available merchandise to delay acquisitions as much as possible, but still to ship the merchandise on time as expected by the customer, breaking down big production Work Orders to fit the working shifts, placing Purchase Orders at the right times, etc. There are many ways in which those tasks can be achieved to always ship on time and delay acquisitions as much as possible. Our Supply Chain Optimizer is a perfect example of Intelligent Robotics, it does what needs to be done, but it's guided by heuristic rules that we refined over many years of experience. Below we detail the advantages of AI and IR by using a typical food manufacturing company as an example, and comparing what the humans had to do when using a traditional powerful ERP Suite with what the humans had to do when using a new generation Active ERP Suite. Is the saved work all the advantage that AI and IR bring? In the comparative above we have assumed that humans would perform impeccably, with no human errors introduced, and thus with no costs generated by having to identify (suffer) and correct human errors that are naturally introduced when operations are run by human users. This is not a complete picture, far from it. Shipping late to an important customer can affect the future sales of a company in a drastic way, orders can be lost, and much worse, customers can be lost due to late shipments. Failure to order needed raw materials in turn can delay the execution of work orders, which in turn can lead to late shipments and idle personnel. There are many actions taken, or not taken, by human users that determine that the operations of the company are far from optimal. This means lost business, late shipments, late collections, impacts in the cash flow, more difficult repeat sales and a huge number of situations that CEOs had to live with when operations were carried out by humans supported by a traditional ERP Suite. Robots, on the other hand, never forget a shipment that will be due, never forget to update the files, never forget to check for the availability of raw materials, etc. That is the biggest advantage of all, far bigger than the saved work, that is in itself already huge. Traditional ERP Suites will become unacceptable once CEOs and COOs start to see, in trade shows and through their colleagues, the capabilities of the new Active ERP Suites. An experience we had with a customer is a very good example of what AI can do to produce money for the end customers. In a food processing plant in South Florida we were given a schedule built manually for a full week of production at the plant, starting on Monday morning and ending at the end of the day on Friday. 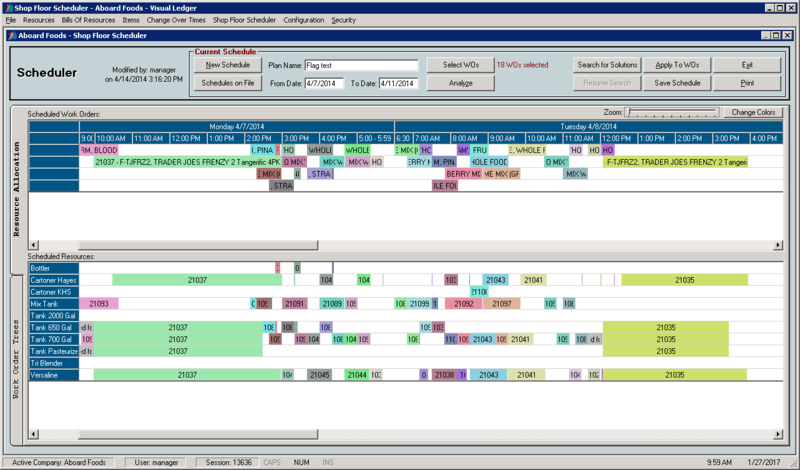 The version of our Shop Floor Scheduler that we were running at the time (shown in the screen shot below) was able to produce a schedule that finished the week’s workload by Tuesday at 4 PM. In short, the scheduler was able to do the same production in less than half the time, which is equivalent to more than duplicating the plant resources and personnel costs. Such a substantial expansion of the plant, in many cases is not even feasible, but could be achieved just by using the existing resources in a better way. Alternately, you could look at the benefit as having cut to less than half the most important cost components of the Items being manufactured that week. The advantage came from using non-trivial schedules that allow more work in parallel, utilizing resources for several different Work Orders simultaneously, while making sure that the resources will always be available when they are needed, but avoiding having “idle time” when they could be used for a different Work Order. Think of the Work Orders as puzzle pieces that need to be placed on the scheduling timetable without overlapping, because no resource can be used for more than one Work Order at a time, but matching their jagged edges in a way that minimizes the total length of the time it takes to process all the Work Orders. That is something that humans are not very good at, if the problem has to be solved fast and the solution reviewed frequently when conditions at the plant change or contingencies occur. Humans will tend to produce clear cut schedule solutions and will naturally avoid going into the complexity of trying different scheduling options where Work Orders are processed simultaneously. Even if some combination of the puzzle pieces could be found that has great efficiency, the typical plant manager will not look for them, and the simple reason for that is that looking for complex but optimal solutions would take an inordinate amount of time of the human plant managers. Exploring the many alternatives for placing the Work Orders is a combinatorial problem that humans are slow to solve. A plant manager would need to spend several hours, or even days, trying many solutions that would work, to find the best one, but that time is not compatible with running the plant in real time. Plant managers don’t have the luxury of such time availability for the scheduling task. But as this example shows, the impact of proper scheduling goes straight to the company’s bottom line. At Aboard Software we provide a comprehensive approach to your Business Automation, bringing to your Company very experienced business consultants, real experts in business software, with many years of experience. Our team is not a team of software developers or software experts, it is a team of Business Automation experts, and that makes a huge difference in the results you can expect from the deployment of your new software. After almost 40 years of working as a High Precision, High Performance Software Development Boutique, Aboard Software has been able to tailor the most comprehensive and powerful Business Software Suite in the market today, that fits all of your basic corporate needs out of the box, and that is easily extensible for those atypical very special and very specific needs that you might have. We know that as a Business Executive you face a key decision when you acquire your Company’s new software solution, a decision that can effectively empower you and your team with ability to deliver on your main goals of growth with full control and maximum efficiency, to keep your costs down while keeping your profits up. It is a “must succeed decision”. Because of this, you and the other key executives at your organization that are directly involved in making this “must succeed decision” have to be backed up by heavily experienced Business Software consultants, during the entire deployment process and continuing into the initial period of the operations of your solution after going live. This cannot be left solely to technology-centered analysts. It must be a collaborative effort between your team and our Business Automation experts. We have been successfully deploying Business Software Solutions since 1974, we know how to make you succeed, and most importantly, we know how to make you succeed fast and painlessly. Our implementations are the fastest and most successful in the Business Software Industry, simply because we have developed software tools to handle the implementation itself. And now from our Web site you can even try our deployment tools, and for free. They will allow you to put your own data into a database that you can then use for trying our software, in our online servers or in your own computers. In just a few hours. And while you are at it, take the opportunity to ask us for our expert opinion on your special business needs. It is still free, and it will put at your service expert consultants with tens of years of experience. How could you go wrong? Aboard Software is a developer of high quality, high performance complete business solutions. The company solutions provide a range of tools for all aspects of complex business operations, making them simple to perform and manage. From Business Operations to Enterprise Resource Planning, Aboard Software has been helping companies grow and simplify their operations and accounting by integrating all functions in real time, eliminating inefficiencies and operational redundancies, promoting full interaction with business partners and providing executives with state of the art business control and decision making tools. Typically companies grow at the expense of their originally lean and healthy organization and methodology, generating inefficiencies and disconnects between different members of their growing teams. Good real time operational software tools allow companies to keep a low head count, and to keep the team working at maximum efficiency, speeding up operations, eliminating complexity and enhancing effective information propagation, by providing a general repository of business information that is selectively enabled to users by individual security rights. Since 1974 Aboard Software has been helping companies achieve maximum efficiency by providing technology, applications and services that allow them to rapidly and effectively build and access a comprehensive repository of business information available to all the team members, and at the same time providing those team members with powerful tools to simplify all aspects of their day to day operations. Accurate information leads to better decision making and better decision making leads to successful business. Before software deployment, the Aboard Software technical team will perform a comprehensive analysis of your business and optimize your Company’s operational methodology, to make sure you obtain the maximum return from your software investment. Aboard Software will contribute its almost 40 years of experience to your organization. We will help you achieve your corporate main goals: Growth & Larger Profits.